Another great mix of black and white! Our clients were looking to create a Pinterest worthy fireplace and built-ins. This is what we gave them. 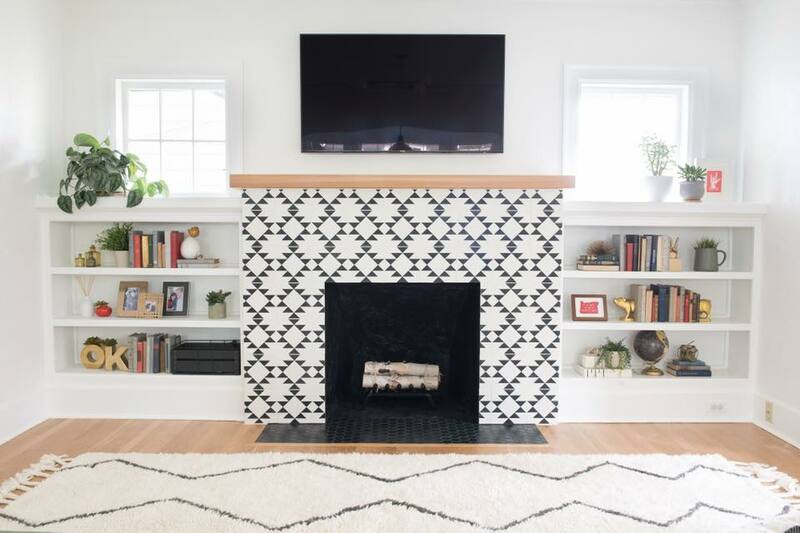 This upgrade turned an eyesore fireplace that pushed too far into the room into a magnet for family life. We custom made the built-in shelves, and made the mantel from a single cedar slab. We ran the wires for the entertainment system in the wall for a seamless, clutter-free look. We reduced the footprint of the fireplace and clad it in these eye-catching one-inch stained concrete tiles. Getting the corner just right involved carefully grinding these thick tiles to meet at a mirrored line, and the design wraps seamlessly around the corner. Our clients couldn’t be happier with the new centerpiece of their family room. © 2018 Above & Beyond Home Improvements, LLC. All Rights Reserved.